Wash the crawfish and pick out any fish bones or other debris. Fill a BIG 40 quart stock pot a quarter full of water. Add the salt and peppers and bring to a boil. Add the whole onions, the corn and the new potatoes [it will be easy to remove them later if you put them in a cloth sack].Return to a boil, cover, lower heat to medium and let cook 8 minutes. 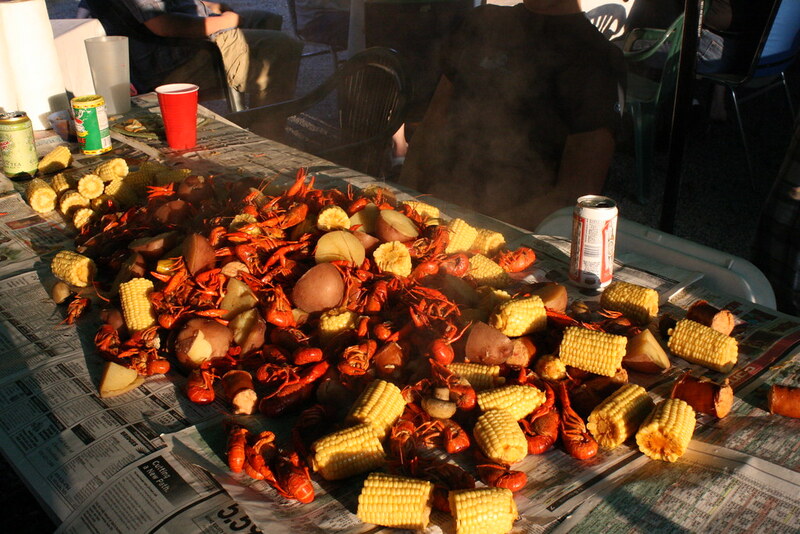 Add the crawfish, cover again and raise the heat to high. After steam begins to escape from under the lid, cook seven minutes more. Remove from the heat and let sit for four minutes. Do NOT remove the lid until this point. Remove the onions, corn and potatoes to a bowl and drain the crawfish. Place the crawfish in a large insulated container [an ice chest works well. Have ready the additional seasoning mixture. Sprinkle over the crawfish and mix them well to coat. Cover and let sit for seven minutes. Serve immediately with the vegetables on the side with lots of French bread on a large table covered with plenty of paper.